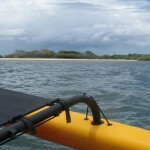 One of the features that drew us to the Hobie Tandem Island was the Mirage Drive. 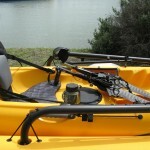 This unique propulsion system allows you to propel the kayak along using your legs instead of your arms. 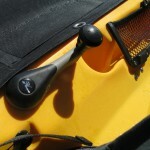 In a recent article at Modern Kayak Fishing (formerly Yakass.net) on the “8 myths about Hobie kayaks” Josh discussed a number of issues people raise with Hobie Kayaks, including the Mirage Drives. “Myth 8: I Can’t do That” is to do with a belief by some people that they aren’t fit enough to use the Mirage Drive. Pedalling is a lot easier than paddaling, physically and technically. 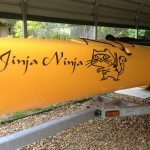 When we got the TI we started thinking about what we would name her and pretty soon the “Jinja Ninja” stuck. So of course, we had to make it official with a decal from ausfish.com. But why the Jinja Ninja? 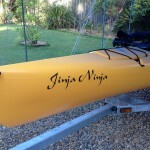 The Maiden Voyage of the "Jinja Ninja" occurred on the 18th of February with a launch from Manly into Moreton Bay.